First, I want to thank everyone that came out to see the Best Friends of Comedy Tour in Toronto, Chicago, and St. Louis. We had an amazing time, and we're hoping to hit the road again soon. I'll be performing at First Round Fridays tonight at 8:00 in Williamsburg. 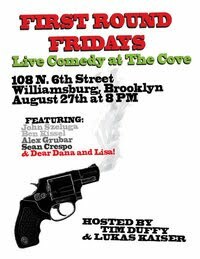 It's a free show hosted by Tim Duffy and Lukas Kaiser, and features performances by Ben Kissel, Alex Grubar, Sean Crespo, and Dear Dana and Lisa. It all happens at The Cove, 108 North 6th Street, Brooklyn, NY. I'm still looking for people to join me in the NYC Kidney Walk. Please visit http://donate.kidney.org/goto/johnszeluga to join the team or to make a donation. Finally, Justin Sarachik wrote a nice article about me in the Staten Island Advance yesterday. You can read it here. I hate the picture that they have on file for me, but I do like that the picture was taken at The Cup on Staten Island. Unfortunately, The Cup is closing. That's the place where I really started performing live, both with my old sketch troupe and as a stand-up comic. I'm sad to see it go, and I really hope it isn't gone for long.